Let’s throw it back to when we where kids, have a look at this cool t-shirt that will definitely get some looks, laughs and well basically draw attention. On the front of this fun t-shirt find the text “Ride Or Die” and an image of a child’s pedal tricycle, this is a fun way to say that you ride or die … but we are not talking about motorcycles here. This Ride Or Die tricycle t-shirt is made to be very comfortable and also be durable to last a long time, it can be found in a wide variety of colors as well as many sizes. 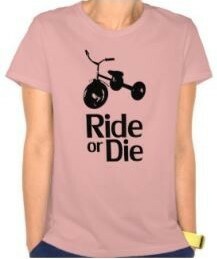 You can get the Ride Or Die tricycle print on other styles of shirts. Go old school with this Ride Or Die Tricyle T-Shirt.